I’ve been trying to get an update out to you for a while and as you know time keeps slipping by. Maggie has been fun and a challenge. She has been getting better with crating training, but still has slight separation anxiety. She’s potty trained with the bell on the door. She now knows sit, lay down, roll over and she brings me her food dish when she’s done. But best of all she’s sleeping through the night!! 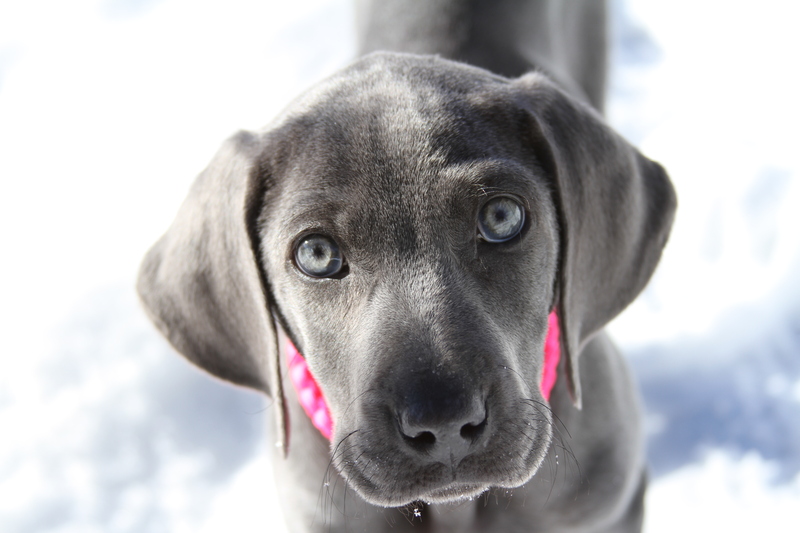 Her 9 week vet check was fun, the vet rarely sees a Weim so a blue one caught the eye of the whole staff. Maggie was taken to the back to be weighed and became a show and tell. Her vet check went well, she did however have a bacterial infection in both ears which was an easy fix. All in all, she’s been fun- and the family, including the cat, are really enjoying her. She has become a really joyful addition to our family. We also want to remind you to stick to the suggested vaccine protocol. Raising the puppy you will find yourself in the thick of things. It is easy to rely on your vet for direction. We have the greatest respect for our friends in that profession; however, their vaccine protocol is meant to cover a broad-based practice. They must operate in this manner. We (Weimlovers) have to remember to do things a bit different for the benefit of our Weimaraner. That means getting the titer test in lieu of a sixteen-week shot, and when you get a puppy shot, it should not contain Lepto or Corona. If Leptospirosis is endemic to your area, please do the shot separately. Vaccinating in this manner, you get better protection, as well as less risk of a vaccine reaction (some of which can be life-threatening. Finally, any number of small things can go awry. Bacteria, parasites, and general health issues can pop up. This doesn’t mean the pup is sickly, but the developing immune system can get overwhelmed. Be as holistic in your approach as possible. 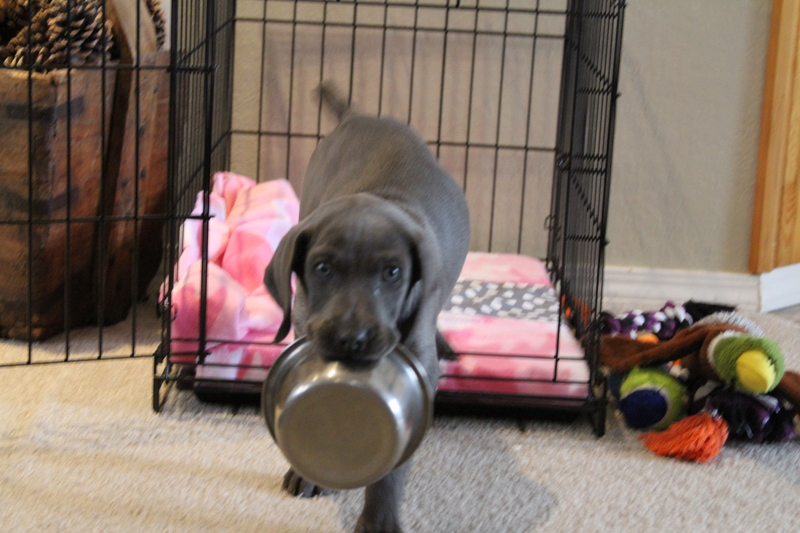 Raising the Weimaraner takes work. Regardless, they have a growing fan club. 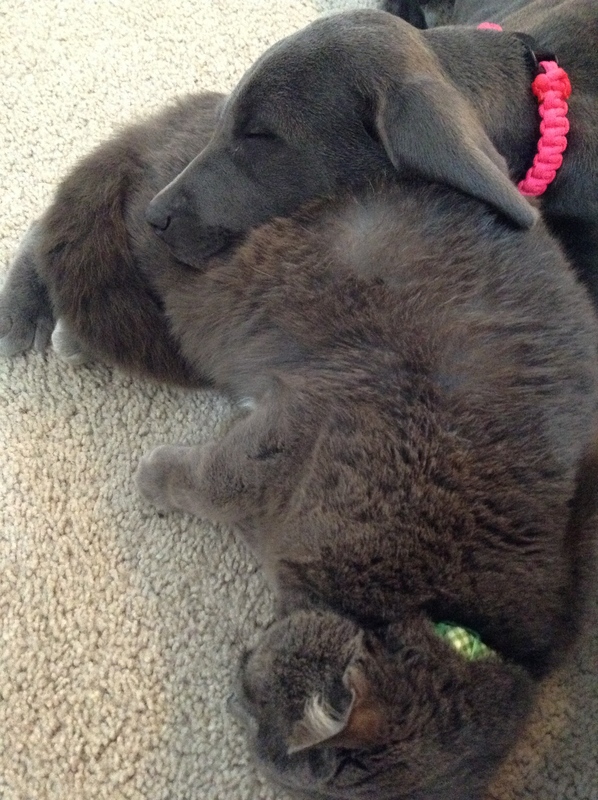 Posted on March 5, 2014, in Cats and your Weim, Crate Training, Getting started with a Weim, House Training, Mesquite X Stackhouse, Previous Pup Update, Puppy Development, Puppy Information, Puppy Tips & Info, The Weimaraner and tagged Blue Female Weimar, Blue Weim in Idaho, Female Weim Adjusts to life in Idaho, Kitty Pillow for Weim, Northern Idaho Weimaraner, OwyheeStar in Idaho. Bookmark the permalink. 1 Comment.